Doug Hiddleson lives on Washington Street. Both his home and his automotive business are within a few yards of the tracks and the crossing. He understands the need for sounding the air horn and is fine with that — for obvious reasons of safety, and federal regulations too. But does the engineer of the yard engine have to sound the horn so loud and so long? Hiddleson has talked to somebody at ODOT and also tried to reach the railroad about this. He has looked up the rules on train horns at crossings, and he’s convinced that whoever is driving No. 1501, especially on Thursdays, is overdoing it with the horn. He has video on his phone to back him up. Passing freights also sound their horns, but their blasts are not nearly as penetrating, maybe partly because they are moving at a good clip while the switch engine creeps along very slowly. I too noticed the difference while standing at the crossing with Hiddleson on Wednesday afternoon. One strange thing: The horn is intended to warn motorists that a train is approaching (as if the flashing red lights, clanging bells and lowered barrier arms are not enough). But when a train being switched backs up across the avenue, there’s no air horn at all. The horn sounds only when the engine, trailing the cars it is pushing, reaches the street. Can anything be done about the blasts from No. 1501? We’ll see. In the meantime, two other issues are still unresolved: the bumpy and worsening condition of the crossing itself, and the lack of sidewalk gates, or indeed sidewalks. ODOT has a plan to fix all that. The estimated cost was $1.3 million when the plan was approved in 2017 and slated for construction in 2020. Construction now has been pushed back to 2021. The project called for upgrading the signal system, improving all four sets of tracks with concrete panels in the roadway, repaving the approaches on Queen, and redoing the sidewalks to comply with the federal disabilities law. City officials met with ODOT two weeks ago and plan more talks to explore whether and how to coordinate the crossing work with a scheduled city project to resurface part of Queen Avenue. Doug Hiddleson has an issue with the length and volume of the air horn blasts of the Portland & Western’s yard engine No. 1501. Having watched your video, I believe the engineer is mostly rules compliant regards whistling, other than that one toot when they started shoving in. The crossing signal he gave later may not have been long enough (in the view of some managers) as some expect the whistling to continue until the crossing is completely occupied. In my experience, I have had pedestrians run around the end of the locomotive in that same situation but no one was killed or injured when I was running, thankfully. Getting back to that single toot, the engineer could have been acknowledging his conductor’s instruction or responding to a motorist’s middle finger salute, hard to tell for sure. The video that hh took is different than mine. I have their traditional dash dash dot dash 2 second 2 second one second 2 second but the final one is 15 seconds long. And that was in the middle of the day, the same applies all evening into the early morning, and to the next day. The whistle requirement is that the ” long-long-short-long” be prolonged or repeated until the crossing is fully occupied. So, at slower speeds that will be longer. The railroad was built through Albany in the 1870s. Nobody who is complaining about the noise is 150 years old. If you don’t like the noise, why did you buy a house near the railroad tracks? I’m sure you would also complain if the engineer DIDN’T blow the horn and someone was hit/killed because “they didn’t hear the train coming”. These folks are also welcome to pass a bond measure and tax themselves the $50 million or so to build an overpass…but…why pay taxes? It’s better to whine and complain about a big, greedy, heartless corporation and do nothing. If the complaints keep coming, just shut the damn crossing down, erect big concrete sound walls along both sides of the tracks so people can’t get across and call it done. Dear sir I have lived in Albany my whole life and I’ve lived in the same location for over 15 years the train horn has changed in the last 3 months new engineer you can tell by his signature whistles, the normal dash dash dot dash followed by an extra dash. Now it’s train horn on for sometimes 15 seconds is deafening. I work a little over a block away and I hear the trains all day long. There is definitely is a new conductor. If you’re on the phone in my office when he’s blowing it you’re screwed because you can’t hear. I’m used to the other toots and signals and this one conductor is just extremely excessive. There is the normal train noise and then there’s this one guy who almost seems like he’s doing it to prove a point or something. The air horn use in the video is totally appropriate and consistent with every other crossing near a switching yard I’ve been to. This gentleman’s beef is with the federal railroad rules and not this railroad. They are following the rules as they are required to do. Yes the train horn in this video is appropriate the video I have showes the train going across the tracks at the same speed doing its normal dash dash dot dash but the last one is 15 seconds long, and that sir is deafening. Then multiply that by all day long and all evening long the last one around 4:30 a.m.
Progressive communities, such as Salem, passed a law banning trains from sounding their obnoxious air-horns inside the City, especially at the busy 12th Street strip going past the Capitol building area. Since that ban was passed, the number of train-human and train-vehicle incidents has neither gone up or down. In short, there is NO real reason why trains must sound-off, other than inertia and ancient federal rules. Get real, Albany. Do something besides chitter-chatter. Not correct. 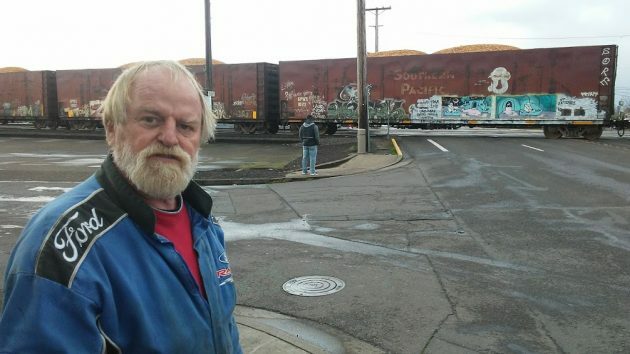 Salem has no power to ban train horns. What they did was do millions in improvement by the tracks to limit pedestrian access and cut a deal with the Railroad Administration for a quiet zone. The technique used is not what’s important. Salem had the same problem and solved it. Albany….not so much. Talk is cheap. Action’s what counts. End of story. It does make a difference. That’s why we rely on a free press to help the populace to discern between fact and misinformation. I agree, talk is cheap. Whistle Quiet Zones are not, however. The equipment that is involved to warn bystanders and traffic so the engineers don’t have to whistle is insanely expensive and the communities must fund most of it. So yes, talk is cheap but who pays for action? That is Albany’s problem. They don’t want to pay for it. Quiet zones have been considered but you have to realize the cost is $200,000+ per crossing. Salem spent many millions of dollars to eliminate the horns. Many cities have made an arrangement with the railroad and the FRA (A division of the Federal government’s transportation department that governs the railroads) where the train operator doesn’t blow the horn at crossings and the city picks up the liability if the train hits a car or pedestrian. Another alternative, are crossing signals that have loudspeakers that simulate an air horn as the train approaches and the gates come down. There’s still the noise, albeit a bit more palatable. To me, the horn blowing is a non-issue, as Erik points out… the railroad was there first. Besides, I heard nothing out of the ordinary as far as the air horn blast goes. Don’t like it, get ear plugs or move. Reminds me of the countless people that bought property near the new Sacramento airport and then complained of the jet noise. Originally, there were no housing developments within 10 miles of the airport. It is now surrounded by homes. This video does not represent the actual event the normal train whistle is a dash dash dot dash, 2 seconds dash @ and one second for dot. My video shows a sustained train whistle of 15 seconds long, This has exceedingly gotten worse in the last 3 months. And this is all day all night.(time’s. 60 ? ) My answer to this would be to regulate the amount of air going to the horn. Which the engineer can regulate at his or her discretion. P&W got all that government money to add a couple spur lines in Millersburg under the claim they would be doing more switching down there. It appears they didn’t hold their promise (big surprise huh? ), wonder if there is any recourse to get the taxpayer money back? The city is actually cut in half for a good portion of the day do to the “train Building” that is going on. If my memory serves me right several million dollars were spent to assist in moving the train building operation out to the Millersdurg end of town. I never noticed any effect to the long delays on Queen Ave with the money spent for Millersburg. The new police station is directly effected by the train building. They literally have to travel several miles in order to get to locations east of the tracks effecting response times. Like usual nothing will happen here until someone of authority and power is personally affected by the delays in this crossing. Albany is the most confusing city for one’s to maneuver about that I know off. There is so much wrong with this crossing as well. It becomes road rage at it’s best with many racing to get across before the arms come down. In my opinion Queen Street is a danger zone. Outdated with cars racing up and down way beyond the speed limit. This project is way overdue. I side with Mr. Hiddleson in the case something needs to be corrected. Not only with the noise which can darn near make one lose their hearing but the traffic delays etc. Why it hasn’t been is beyond me. Odot spends half a billion on highway 20. Our infrastructure is so outdated it’s pathetic. To pipe in, on this one, it’s not just being done at the switch. I live on 1st street near the infamous truck muncher trestle (as it’s been deemed due to the amount of trucks that hit it) and have been woken up in the middle of the night several times due to excessive horn usage (and I usually have a soundscape machine going). I don’t usually hear the horn blasts on a normal basis, but there are instances where the engineer lays on the horn constantly for a ridiculous amount of time….. in the middle of the night (1 am-ish +/-). My neighbors and I have talked about it several times and even called the railroad and complained with no solutions, only excuses. There is no reason to lay on the horn in a constant manner (no dash, dot pattern, but consistent) like that in the middle of the night through a residential area! I suggest HH, on his bike, confront the new whistle blower in the switch yard and ask questions. Then ask to see his supervisor to manage the soundings. I’ve lived in West Albany for ~20 years and have never had troubles sleeping due to excessive whistle blowing however, in the last several months, I have suffered a severe lack of sleep due to the loud and constant whistle blowing throughout the night….and I mean all night!! I can’t figure out what’s changed. I’m so sick of it I want to raise a law suit against someone to get it to stop. Any suggestions…….. Noise pollution from these freight trains is very much real in greater Albany. I live in North Albany on the hill that runs up from Thornton Lake and down to Gibson Hill Drive. My home is nearly 3.5 miles from the intersection of Queen Ave and Pacific Blvd yet I’m jolted from sleep regularly at least a few times each week by the freight trains’ many obnoxious sounds of varying frequency and earth shaking vibrations. I’ve taken decibel measurements of the noises that have been near 130 dBA. I suspect the reason why more citizens haven’t demanded change is because the majority of them have already experienced permanent hearing loss from the trains and no longer hear accurately.